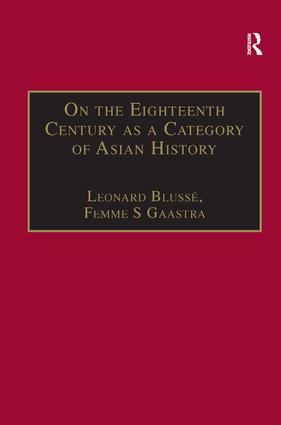 The starting point of this volume is the scathing attack, far-reaching in its consequences, launched in 1942 by J.C. van Leur on the views then current on the character and significance of the 18th century as a category in Asian history. His denial of European pre-eminence in Asian waters represented a direct attack on colonial historiography. The essays here derive from an international conference held 50 years later, to assess the impact of van Leur’s work. In part historiographic, in part drawing on new research, they aim to delimit the boundaries of European-Asian interaction, and to provide case studies of what this period actually meant for the history of South and East Aia. Contents: Introduction; the 18th century as a category in Asian history; J.C.Van Leur, 1908-1942: a short life in history, Jaap Vogel; The 18th century in Southeast Asia, David K. Wyatt; The long 18th century and the new age of commerce in the Melaka Straits, J. Kathirithamby-Wells; Periodization, institutional change and 18th-century Java; Mason C. Hoadley; Princes, pretenders, and the Chinese phrakhlang: an analysis of the Dutch evidence concerning Siamese court politics, Dhiravat na Pombejra; Japan in the 18th century: demography and economy, Akira Hayami; From company to individual company servants: Dutch trade in 18th-century Japan, Yoko Nagazumi; Domestic interregional trade in 18th-century China, William T.Rowe; The impact of the international tea trade on the social economy of Northwest Fujian in the 18th century, Zhuang Guotu; The 18th century in Indian economic history; Irfan Habib; Trade and politics in 18th-century Bengal, Om Prakash; Merchants and commerce in Coromandel: Trends and tendencies in the 18th century, S. Arasaratnam; Van Leur and the Indian 18th century, C.A. Bayly; Index.